What is the difference between grace and mercy? That is the question we will be looking to give an answer to in this post. Grace and mercy are buzzwords in Christian circle. You often hear them used in response to questions such as “How are you?” To which someone would respond with, “I am doing well by the grace of God!” This is true. Yet, when we use a word to often it tends to start to lose its meaning. Imagine reusing salt over and over again. After a while, your taste buds become desensitised to it. Beyond that, the salt used also begins to lose its impact. Mercy is somewhat different. It doesn’t easily fit into conversation. At least, not in a thoughtless way. Let’s start off with the dictionary meaning of the two words, and expand from there. Grace is both a noun and a verb. A common definition of grace in Christian circles is that, It is unmerited favour. Grace is favour that you cannot earn or could not afford. John 3:16 is an expression of grace. God knowing that we could not afford the debt we owed for our sin chose to take the case upon himself. In the Bible grace is manifest in two forms. The Old Testament expresses it as Chen. In the New Testament is manifest as charis. Mercy is compassion or forgiveness usually shown to a weaker person by one who is in power or greater. The key Hebrew term for mercy is checed. When you take the two together you will realise that they are intertwined in many ways. To go back to the example we set from John 3:16 earlier. One can say that, it is because of God’s mercy upon mankind that he showed grace by sending his son to die in our place. He was lenient. The result of this leniency is that he showed favour to mankind. Grace is a vehicle through which we are saved. We use the gift of faith to believe in and accept this grace that we have been so freely given. There is an emphasis at the end of this, “not of works” it says. This is to say that there is not anything that we have done that qualifies us for grace. 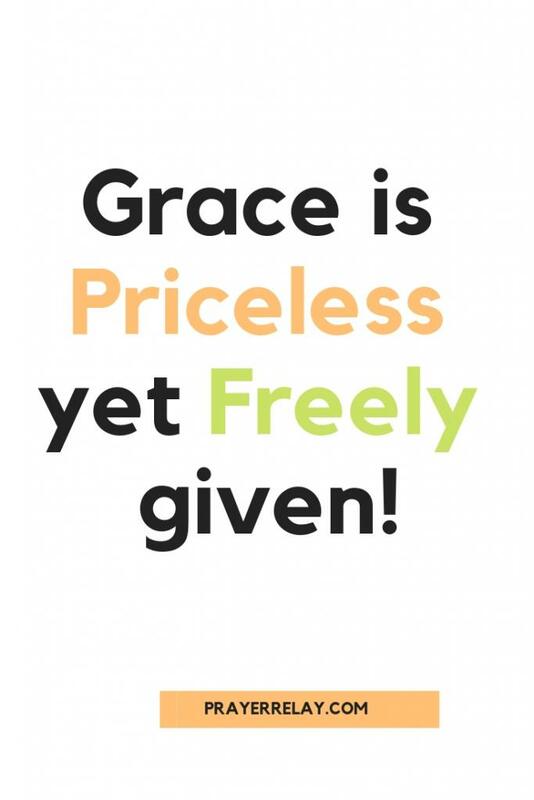 Grace is priceless yet freely given! The king loved Esther more than all the other women, and she obtained grace and favor in his sight more than all the virgins; so he set the royal crown upon her head and made her queen instead of Vashti. Esther was helpless. She was a refugee who had nothing to offer, nothing tangible at least. Yet she found grace and favour. This is the best example of how free grace is. Grace levels the playing field. Where background, family history and statue in society could have put Esther at the back of the queue, grace magnified her. Under the old covenant, one had to pay for what they received. This could be done by sacrifice and better yet by living a righteous life in the eyes of the Lord. Grace is of the new covenant. It is a result of Jesus becoming the lamb that would have been sacrificed for atonement under the old covenant. Thus, grace came through Jesus Christ. Mercy can be obtained at a cost. It is being removed from harm’s way, when you deserve to be harmed. The term beg for mercy is very indicative of this. One cannot beg for grace, as it is without discretion. Mercy is given at the one in power’s discretion. People can deserve mercy, as a result of an act or sacrifice that they have made. Grace on the other hand can never be earned. 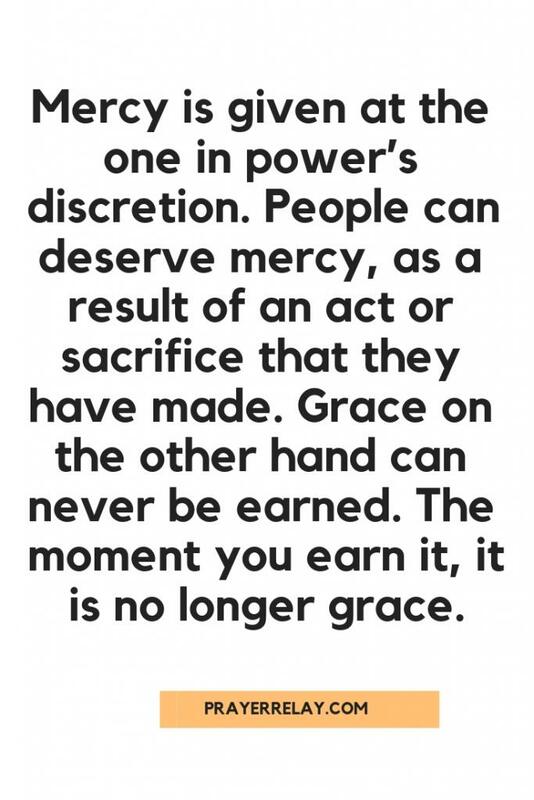 The moment you earn it, it is no longer grace. There is not one Christian you can find who doesn’t know this chapter of the bible. Most will recite to by heart. If you roll back a few verses, you will find that this is contingent on God being your “shepherd.” Mercy is afforded to all who walk with the Lord. Mercy is tied to intention at some points. This is to say that the Lord doesn’t look for perfection to give mercy. He grants mercy to those who ask for it, and for those who try to walk upright. Do not remember the sins of my youth, nor my transgressions; According to Your mercy remember me, For Your goodness’ sake, O Lord. King David is one of the greatest examples of walking in God’s mercy. He was not a perfect man. The key part was that he was conscious of this fact. He would be described as a man after God’s heart. Falling short of God’s glory, but always striving to get back on the right path. David was conscious that he had lived in sin and transgressed. Therefore he asks for mercy from God. That the Lord would put mercy in front of sin. This is what Christ has become. He is our ticket to mercy from God! Mercy is granted without reserve to those who fear the Lord. Fear in this case is not being afraid. Fear of the Lord is having reverence. When you revere the Lord, you do things because you care. You do things because you want to walk in his will. This is the same thing that we have shown in the case of King David. Mercy can be begged for, grace cannot. Mercy can be paid for, grace cannot. Grace can never be earned, mercy can. 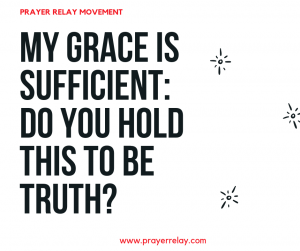 My Grace is Sufficient: Do You Hold this to be truth? The message of “My Grace Is Sufficient” if often lost in the rest of the noise that this world throws at us all. This generation is under more pressure than any other generation that has come before it. There is unprecedented opportunity and unprecedented levels of temptation. The number of suicides alone are a testament to the pressure. There is need for that grace, now more than ever. The beauty of it all, is that it is promised. 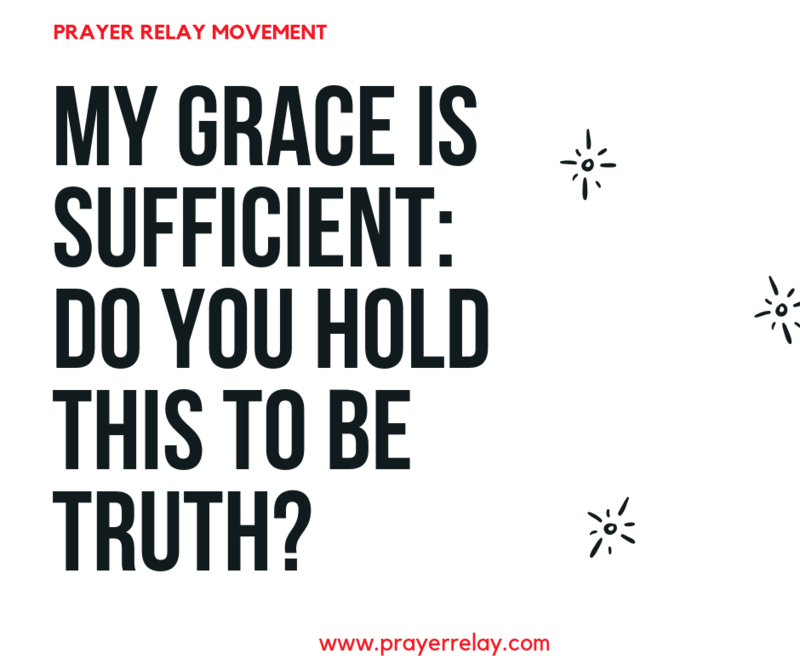 Not only is it promised, but God says that “My grace is sufficient.” This tells us that it is enough. No matter the situation, his grace is enough to lift us above it all. Grace is favour that we have not earned, and cannot earn. Grace is given to us freely, with neither request or effort. The moment we earn it, it is no longer grace. Grace is unmerited favour. Isn’t crazy that in a world where everything comes at a cost, the thing that we need the most is given freely? You can read more on grace here. 8 Concerning this thing I pleaded with the Lord three times that it might depart from me. 9 And He said to me, “My grace is sufficient for you, for My strength is made perfect in weakness.” Therefore most gladly I will rather boast in my infirmities, that the power of Christ may rest upon me. 10 Therefore I take pleasure in infirmities, in reproaches, in needs, in persecutions, in distresses, for Christ’s sake. For when I am weak, then I am strong. Now, we do not know what it was that Paul pleased that it may be depart from him. There has been speculation among theologians for as long as I have been a believer in Christ. None of these have been anything beyond speculation. Let us break this down to see what we can glean from it. We do no know what that meant on a practical stand point. Our God is a mighty warrior. His grace is sufficient for you to continue to walk through that storm with your head held high. His grace is also sufficient to pull you up when the storm is pulling you down, as we saw with Peter. My grace is sufficient is a bold statement, which should in turn embolden you and I as believers. Whatever the situation before you is, God’s grace is sufficient for it. You do not need anything or anyone else when you have God by your side. God is enough! Now this one goes against everything that we are taught growing up. Boys are raised to “man-up” and never show their weakness. Girls are taught to be independent. That they do not need anyone else. They can do it all by themselves. This is good and well, except faith is about dependency on Christ. My strength is made perfect in weakness, is what he says. Not in our strength! It’s in our helplessness, in our hopelessness that his strength is made perfect. When he is our hope, he is our help! You often hear it said that, “God helps those that help themselves!” There is some truth in that statement, but it is not the whole truth. He is God of the helpless widow and of the orphans. His strength is made perfect in weakness. Our weakness means that we have no choice but to yield to his will. When we think we can do something in our own strength or wisdom, even when we pray, we are not waiting for his lead. We are ready to go and do it. Social media has put this generation under constant pressure of pursuing perfection. If it is not perfect then we aim to make it seem perfect to those around us. This is what we have learned from the lives of celebrities and others that we have often adored and followed. Those whose lives seem impeccable in our eyes, only to find out that they are falling apart behind the scenes. Paul shows us that this should not have to be the case for us. Infirmities are imperfections, the very things that we are taught to keep under wraps and out of sight. Yet it is in imperfect that the power of Christ rests upon us. Are we missing out on the glorious power of Christ by feigning that we have it all figured out? Instead of boldly approaching his throne of grace in our weakness. Hiding our weakness from the world inadvertently places us in a position where we hide it from the Lord himself, or at least attempt to. When we fall short, we no longer seek his face as we ought to. Failing to realise that this is the time where we need him the most. Boasting in our infirmities is also an incredible testimony and beacon of hope for others who may be going through what you are as well. Christianity begins to seem unattainable for those looking from the outside when we as believers are not authentic in our walk. There are people who would come to Christ if they knew that he would take them as they are, with their infirmity. By masking our infirmities, we become less valid as evangelists of the gospel. We often mis-sell Christ when we make things seem as though they will be easier if we walk in Christ. The truth is, following Christ presents its own great difficulties to us. There are infirmities, reproach, needs, persecution and distress to go around. We have never been promised an easy road. 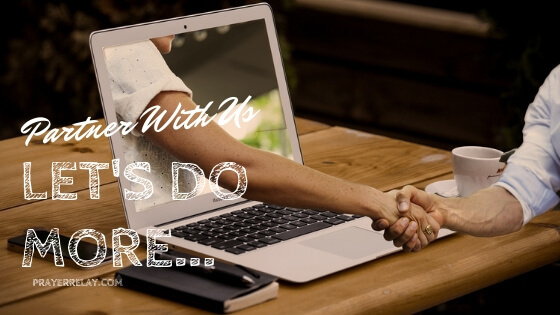 The one thing that we are guaranteed is that we will no longer have to do this alone! We have a faithful Christ to walk with us all the way. The clincher in all of this comes on the last part of this verse. Paul says, “For when I am weak, then I am strong!” His strength is found in no longer trying to solve it all by himself. When he lays it all down before the throne of grace, his weakness becomes his strength. Yet, for the most part we are playing tug of war with God. We continue to wrestle with things that we have committed to him. Is it for a lack of faith that we seek to solve things that we have asked him to solve? Think about it! Unless you are weak, there is no testimony to speak of. A testimony is birthed when you are pushed to the limit. When you are driven to a point that you didn’t know you could reach. Your testimony comes from coming back from a point of no return. When you look around and think that there is no way out of a situation, there rests your testimony. God begins where we stop. When we can no longer see a way, he makes a way where there seems to be no way! There is no testimony is expected victory. Had Goliath crushed David, do you think they would have been a murmur about it? No! That is the natural order of things. Testimonies go against the grain, they go against the natural order of things. Testimonies result from God making the impossible possible. When God says, “My grace is sufficient”, he essentially goes into the background and works things his in our favour. His sovereignty is such that even when we do not realise it, he is working things for our good. 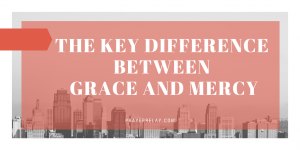 The beauty of grace is that there is no merit required on our part. None whatsoever. We could not possibly earn the things that he does for us. How could we earn Christ laying his life down on the cross for us? Only by grace. Children are perhaps the greatest example of grace. As parents, we do things for our children out of love. They do not have to be the most amazing child in the world. Our love for them is without cost to them. It may cost us everything, but that cost is not the child’s to worry about. We bear these burdens out of love. Have you ever seen a child talk about their hero? How amazing their parent is? I remember a story I was told a while ago. A father who was in some highly paid white collar job came to pick his child up from school. As usual, he was dressed up in his three-piece suit. Upon arrival he found his child waiting for him with other children outside. He could see expectation in their eyes. “I told you my dad would come and help us.” The little one had declared to his friend. They had kicked a ball up into a tall tree. They knew they could not reach this ball themselves. This was a weakness. They could have tried, perhaps they had done so before he arrived. Yet his strength was magnified in their weakness. When he rolled up those sleeves and climbed up that tree for his son.